3 Saves money by reducing administration - Make administration a breeze. Arlo automates the tasks you once did by hand, or in a dozen different packages. Fully automated online registration. Communications and calendar appointments. Invoices and reports. Arlo does the work for you, so you can relax, knowing everything is under control. 3 Enhances client experience - Arlo gives your customers a great experience. Customers find it easy and quick to register. They love how electronic appointments drop straight into their calendar, how registration confirmations include maps and location information, and how reminders are sent before the event. If they change their minds and want to transfer to another date, they can do it themselves, without waiting for an office to open or a phone line to be answered. 3 Increases registrations - To grow your business, you need to retain customers and attract new ones. Arlo helps. 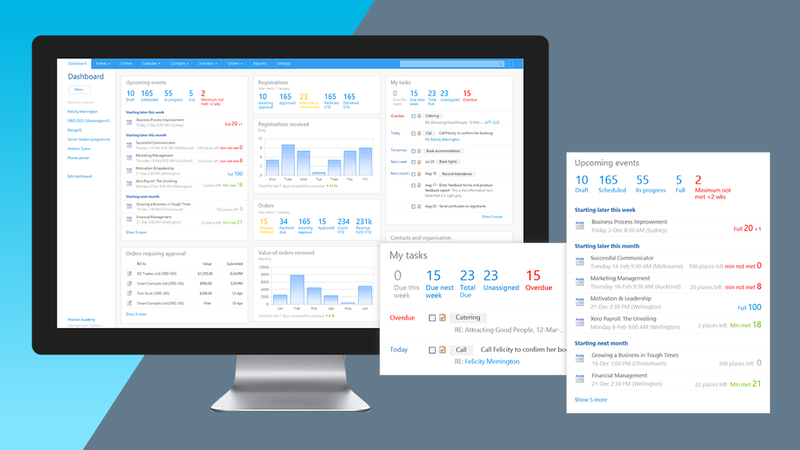 Arlo is a full featured, easy to use, customer relationship management (CRM) tool that can also promote your training and events, helping you to increase registrations. 3 Arlo loves the web - Arlo puts your brand first, with such smooth integration into your website that customers will think they’ve never left your site. Your web developers will love how easy Arlo is to integrate. They can be as creative as they like. 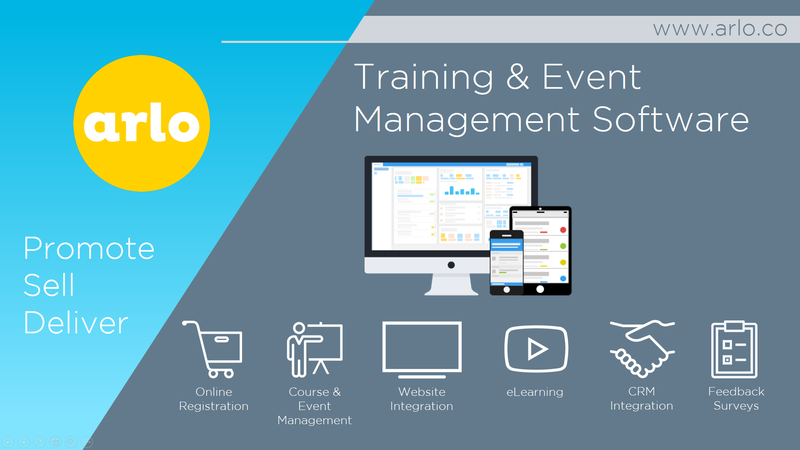 Arlo is a cloud based training and event management software designed to promote, sell and deliver your courses and events. Arlo will automate your manual processes and routine tasks by providing simple scheduling, online registration, automatic communication, custom reporting, payments & invoicing. Client records are kept updated within Arlo’s robust CRM. Arlo's integration with SurveyMonkey makes capturing customer feedback surveys easy. The integration enables you to select which survey to send automatically at each event, and whether to collate responses onto an existing survey or add them to a new survey created for the event. SurveyMonkey surveys created via Arlo will have the event code added to the end of them, or you can rename them manually. Registrants can complete the surveys on their mobile phone or later from a computer. The easy to use reporting tools then help you analysed the information to find out what’s working and what’s not with your training and events. Capture feedback on your presenters, course/event material, facilities, and more. Course and event templates make recurring training and events easy to schedule. Automated communication means registrants receive accurate and timely registration confirmation and reminders. Understanding your registrants is made easy through customisable application processes and registration forms. Arlo’s website integration promotes courses and events on your website keeping information up to date in real time with a seamless user experience. 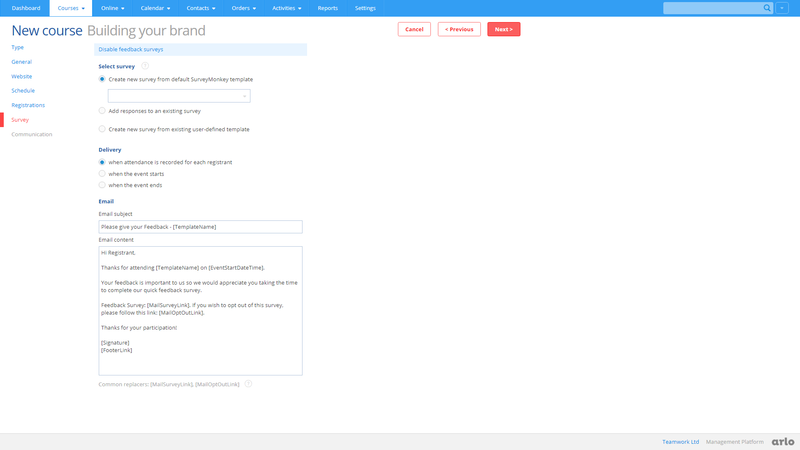 Arlo’s lead and campaign management tools allow promotion of courses and events by targeting specific market segments and monitoring demand. Delivering face to face, live online, self-paced, private or public courses and events are all possible with Arlo. Manage certification, CPD points and use SurveyMonkey surveys to capture feedback and improve delivery. Arlo can be integrated with your other business applications managing the flow of data through your organisation.